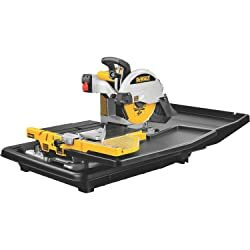 DeWalt D24000 Tile Saw and it’s model D24000S counterpart are a great choice for anybody who needs a powerful, durable, and multipurpose tool with an excellent cutting capacity, manufactured by one of the biggest and most sought-after brands in the tile saw industry. I love this product because it provides a cohesive cantilevering rail system along with 18 inches of diagonal capacity as well as 24 inches of ripping capacity. The rail system is made from stainless steel, which protects it from corrosion such that you can use it for a very long time. The steel blade is 10 inches in diameter and 0.06 inches in thickness. The fact that you can modify it using a key is also a bonus. It is perfect for cutting pavers, stone, ceramic, and porcelain. The saw frame works well with the rail system in ensuring precise cuts. Moreover, it is extremely compact, which makes it easy to carry around. Also, it weighs 69 pounds and can easily be moved back and forth and installed by just one individual. The integrated miter provides you with a choice between 22.5 degrees and 45 degrees. This feature aids you to get fast angle cuts. The depth is around 3-1/8, which the tool highly applicable for pavers and V-cap. DeWalt D24000 and D24000S model’s water pan can hold 5 gallons of liquid and can be placed in either side or rear attachments to hold the blade spay-over and water run-off. The water containment tray and the cutting cart are easy to take out, clean, and move. If you don’t have a bench to put it on, you can purchase the model that includes a foldable stand, which is highly recommended if you are constantly moving around. The product is user-friendly, easy to clean and carry around, as well as easy to install. And just by looking at its price alone – which is quite expensive – this product is not just for hobbyists. It features 1 HP motor, giving the tool sufficient power, which you need to take seriously. Skil 3350-02, seven-inch wet tile saw packed with a HydroLock system would be another great tool for you; it offers great value for its price. So what makes the Skil 3550-02 wet tile saw different from the others? Its HydroLock Water Containment System, which is a new lower and upper guard that aids you to keep the water contained close to the blade. This is the reason for its excellent precision cutting at minimum clean-up. It features a cohesive rail cart system along with a miter gauge 22.5 and 45 degrees. It has an 18-inch maximum rip capacity. It has a 12-inch diagonal cut capacity. It has a sliding side extension that supports tiles of 18 x 18 inches maximum. It can be utilized on either the right or left side of the table. This tile saw weighs 24 lbs, which makes it easy to carry around, and install. I am amazed that while it belongs in the lightweight category, it can cut through stone, porcelain, pavers, and ceramic with it very easily without hassle. The tool’s blade is 0.05 inches thick and 7 inches in diameter. It is constructed from steel and can be modified by key. Plus, the water pan can hold 3 gallons of liquid and is made of ABS plastic. The water containment tray and cutting cart are detachable. Users say this tool can be easily set up, as well as easy to clean and use. Reviewers claim that the tool is perfect for the DIY-er. It is durable and simple to maintain and control. It also has an aesthetic design. 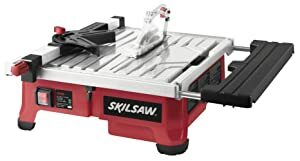 SKIL 3540-02 7-Inch wet tile saw always pops up as among the top finds in the market. It is recommended by numerous professionals, who constantly evaluate the tool. It is also our recommendation that you invest in the model. The product features a cohesive rail cart system, a 2-gallon water pan, and a 2 HP motor. It has 3600 RPM and has a 14-inch maximum rip capacity and a diagonal cut capacity. The blade is constructed from steel and can be modified by key. It weighs `17.7 lbs, which makes it lightweight. It’s ideal for cutting pavers, ceramic and porcelain. The tabletop is made from stainless steel so you won’t have any problems with corrosion. The 7-inch diamond table is intended for smooth and fast cutting. The model also comes with a unique cooling water reservoir, which keeps the tool’s blade cool and reduces debris and dust resulting from each cut. It features an adjustable rip fence and a miter gauge for precise linear cuts. Moreover, it has a 0 – 45 degrees bevel for doing a variety of cuts. You can control your project fully using the tool. It is fast durable and capable of doing a variety of cuts. If the customers loved it, you'd love it too. I love the Lackmond Beast Wet Tile Saw because it offers numerous features that enable accurate cuts and ensure a top-quality product. The tool’s cutting head can be modified for a variety of tiles and easily adjusted to allow for cutting 31/2-inch bricks. The saw cuts 24 inches max and enables you to finish any cutting task quicker. Moreover, the Chicago Electric Tile Saw features a three-gallon/minute water pump that ensures water is continuously and constantly sprayed while making cuts on brick or tile. Also, it includes an oversized steel frame along with a precision bar system that works well with tough and hard cuts. Its strong 15 amp 2.4 HP engine will aid you in cutting through the hardest and toughest tile or brick material, and its durable cast aluminum stops vibration. The saw is a perfect choice. It may not be as great as the Dewalt model, but it is less expensive and will offer you a first-class cut regardless of the material. This tool is highly recommended to the DIY-ers and contractors out there. The QEP Tile Saw, a tiny but powerful contender, is the next best tool on our list and I would recommend it for DIYers out there. What I liked about this tool is that it has a heavy-duty steel table, and its frame had hard, rubber foot pads on it for additional stability. Also, the other parts of the tool were made of either plastic (fence) or metal, which seems okay. But we had several problems aligning the fence. While the guard affixed to it functions well with only thin tile saw blades, thick ones can be too much. The splash guard screw occasionally blocked the tile – if it was 3 inches or bigger – from moving. And the table started rusting only after a couple of weeks. It is crucial to go slowly as you use it to avoid water splash. While cutting, the diamond blade makes too much noise, so we suggest that you purchase ear protectors. We even needed to double this protection sometimes by adding comfortable foam in our ears. If you love DIY-ing, this tool will ideally suit your needs. Also, you can even finish minor contractor jobs using it. However, we have mixed impressions of the QEP Tile Saw. 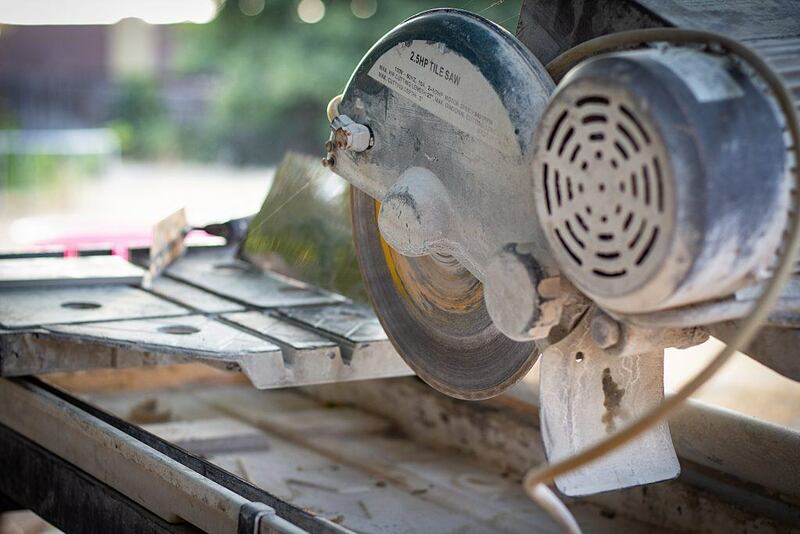 A tile saw with a great blade diameter means you can cut through thick materials. An 8-inch diameter blade has a cutting depth of up to around two inches, while the 10-inch version can cut a maximum of around 2.5 inches. Your saw must be able to cut through any object you choose from end to end in a single pass. Greater blade diameter can mean greater length of an object your saw can cut in a single pass. 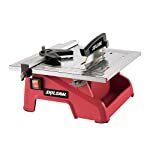 Often, a tile saw specifies – inches – the maximum straight cut or rip cut as well as maximum diagonal cut it can handle. Several tile saws have certain features that enable unlimited cutting capacity but also think about the several limitations of the table size of the tool as well. You may need to buy a table extension to fit big objects. A bigger blade is important when you’re carrying out bigger projects, which have thicker materials, but certainly, it’s pricier too. Also, it’s heavier, affecting its capacity to move around. Thus, it’s crucial to balance your money with what you need. If your saw’s motor horsepower and RPM (revolutions per minute) are great, it can handle tougher materials like granite. An HP with ¾ is enough for minor personal projects, and an HP of 1.5 is sufficient for cutting the majority of materials, but several industrial saws can have 2.5 HP. The horsepower of your saw may be specified as volts and amps, so always convert that into horsepower when needed. Having sufficient juice is important for cutting clean through tough and hard materials very easily as well as finishing large projects very efficiently. With that said, the saw quality matters too! 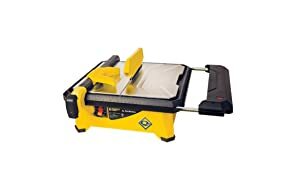 You must think about whether a powerful and expensive top-quality tile saw is essential for your projects. The blade capacity is about the capacity of the saw’s cutting head to be adjusted to hold different blade sizes. 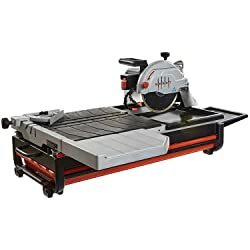 Ensure that you select a tile saw that has this feature if you want to make use of it on numerous kinds of projects, which uses various tiles. The blade adjustment is the key feature to know how appropriately a saw blade can be attuned to cut tiles or bricks at various angles. Tilting the tile saw into numerous angles is even better. While using your tile saw to cut hard material, the water it sprays can prevent damage and aids to cool the blade and also lubricates the tiles, and your tile saw for even smoother cutting. Perhaps, a pump container or garden hose can work as a water source. Also, it depends on whether or not you’re seeking one to make use of at home. Little problems can either make or break any home improvement experience. Always remember extra features that may make your tile saw usage way cleaner and easier. Features like a drain plug or a splash guard mean you can make use of the tile saw without worrying about getting wet. A big water reservoir indicates that you will not run out of coolant fast while a precision bar enhances your cutting accuracy. Also, setting up or maintain your tile saw may be a scary thing to do, but as soon as you have assembled it and quite got used to used it, it’s rather to do your upkeep. My top choice should be obvious. I placed the DeWalt D24000S Wet Tile Saw at #1 because the product is user-friendly, easy to clean and carry around, as well as easy to install. And just by looking at its price alone – which is quite expensive – this product is not just for hobbyists. It features 1 HP motor, giving the tool sufficient power, which you need to take seriously. Which among the five products is your top choice? Feel free to share your thoughts. And don’t forget to share this post with your friends.